The WIA organised the National Field Day for Saturday 23rd October but it was a case of murphy's law.... The weather throughout most of Australia was absolutely dreadful while we sat bathed in sunshine. 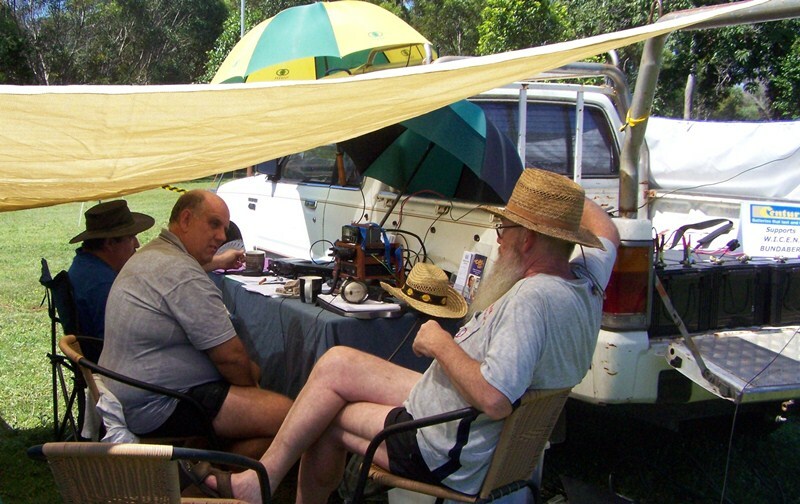 The propagation on all bands was terrible and what few nets we heard confirmed stories of violent storms, rain and quite a few hams shutting down shacks until the storms passed - the radio Gods had decided that nobody was going to play much radio this day. 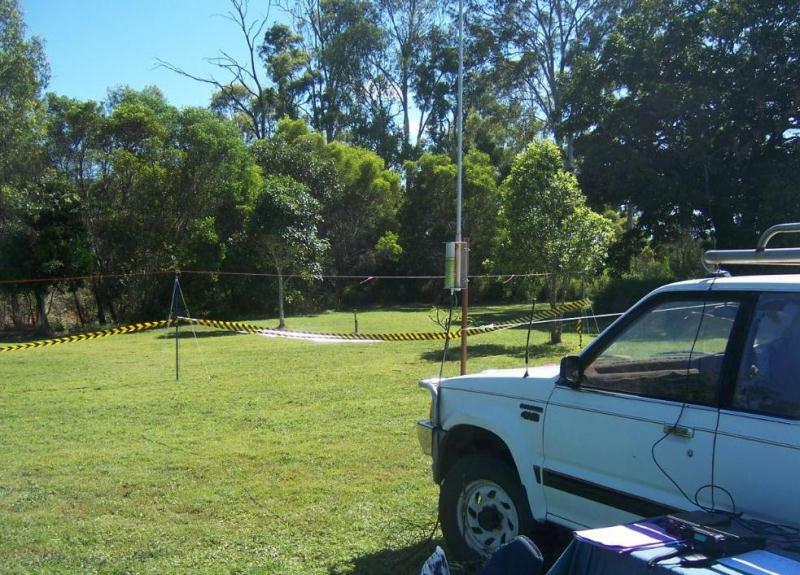 VK4ION was a registered QTH for the field day - located at Avondale - approximately 25km north of Bundaberg - it was a genuine field station, running on battery power for the full 12 hours. 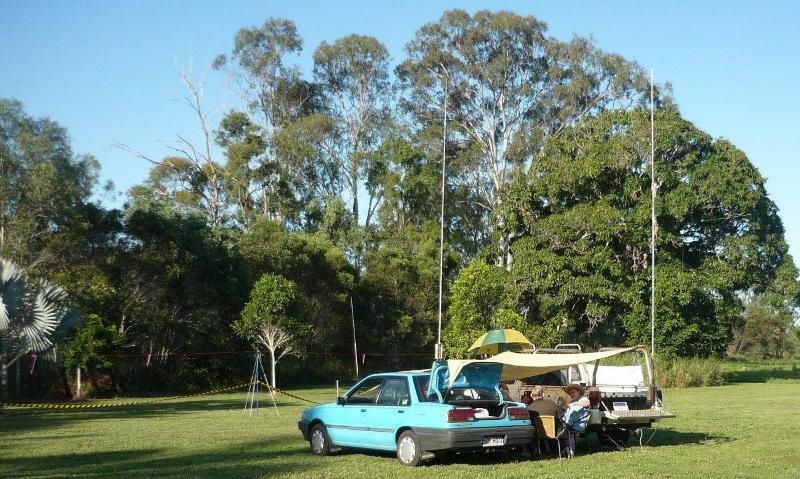 When Century said it was ok to come by and borrow some batteries - it was lucky we took the ute as each one weighed 60kg. 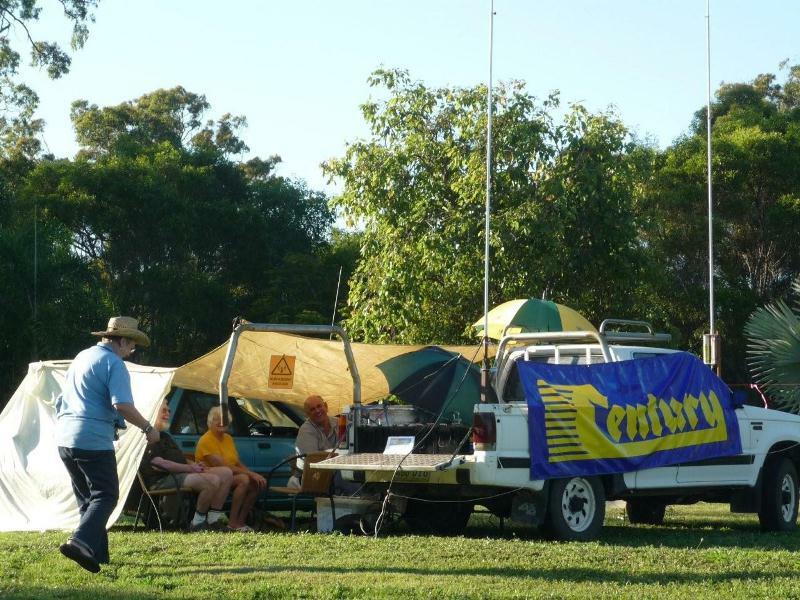 Proudly displaying the Century Battery banner the field station consisted of 1 old ute holding FOUR 450ah batteries, a 40/80M vertical on the bullbar (actually an old CB Stationmaster aerial converted for AR use) and mounted on the rear was a 20M Vertical with ground planes. If you look to the right in the picture above you'll see a Dipole. That's an E.N.V.I.S. 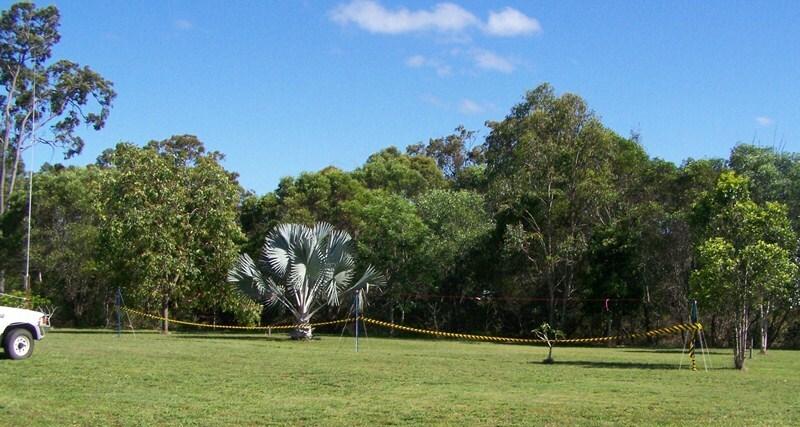 dipole mounted at 1.8metres (6feet) above the ground. It was the success story of the field day, working as close in as Mackay and out to Geelong & Guam). All antennas break down into short lengths and pack away, forming part of the VK4ION emergency kit. 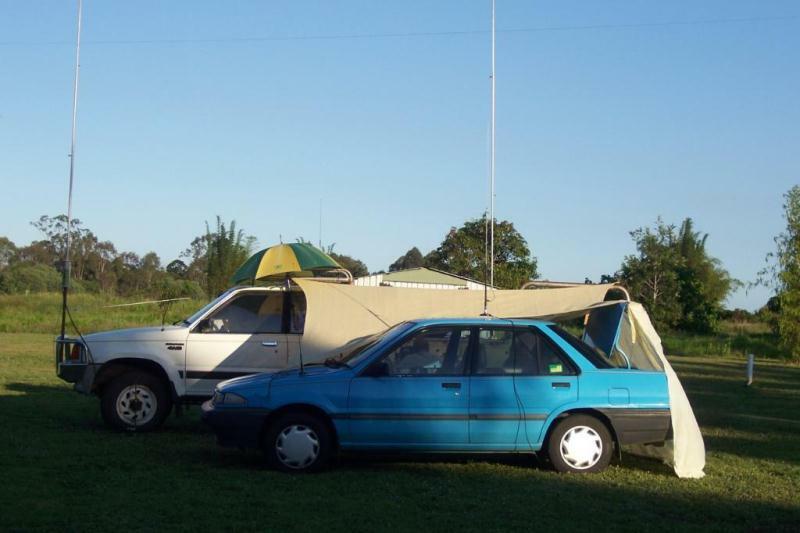 The two transceivers used were Yaesu FT-857D each directly connected to a Century Battery. Antenna tuners were conneted although they weren't needed on the 40/80 Vertical. Despite the extremely poor radio conditions club members VK4ION & VK4MAX worked the full 12 hours from 8am to 8pm. During the day members VK4JRO, VK4SX, VK4JM, VK4JJ and VK4UD made the trek out to Avondale to check on the progress and help make contacts. The BIG thanks of the day goes to Mark, the "Maestro" of antenna construction (as verified by SWR meters on the day!) and Host Most Magnificent. We had lamingtons for morning tea, gourmet sausages and home baked rolls for lunch. 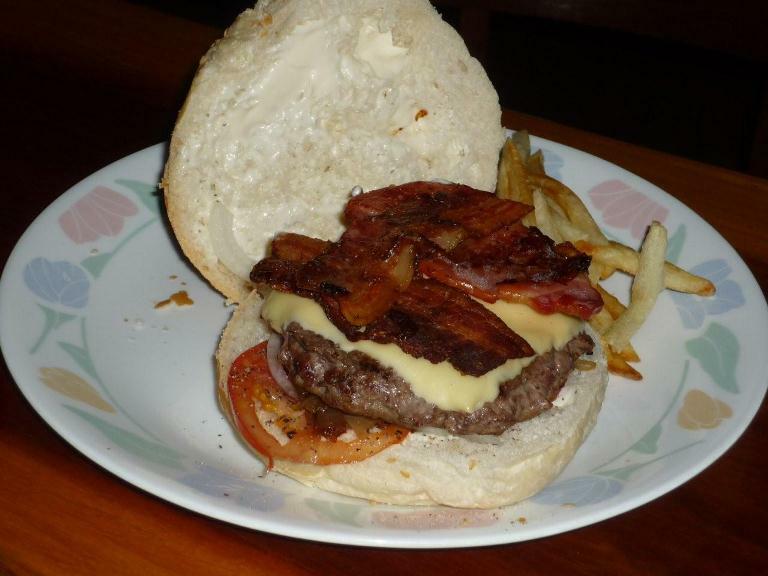 Pizza and BEER for happy hour snack... then authentic American Burgers for dinner with home made Fries and more BEER. Who's the luckiest club in Australia to have such a catering service? So yes... it was a pity about the conditions on the day but we did prove the battery requirements of our field stations running Yaesu FT-857D Tri-band tranceivers (useful data for the new portable WICEN stations which are on order) and we had a darn good time, swapping antennas, checking performance levels all while sitting in the bush and communing with nature. 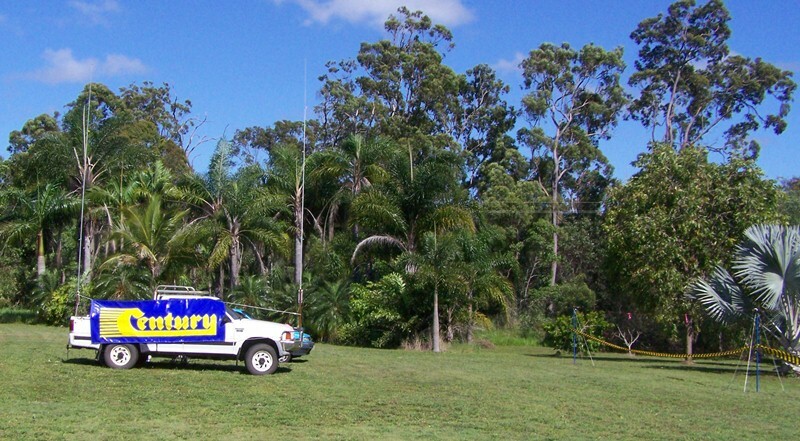 The chap in Guam who was running 1500 watts was shocked to get two calls from battery power on antennas in a back yard near Bundy... now that's what Radio is all about. Can't wait for next time... or the next field day. 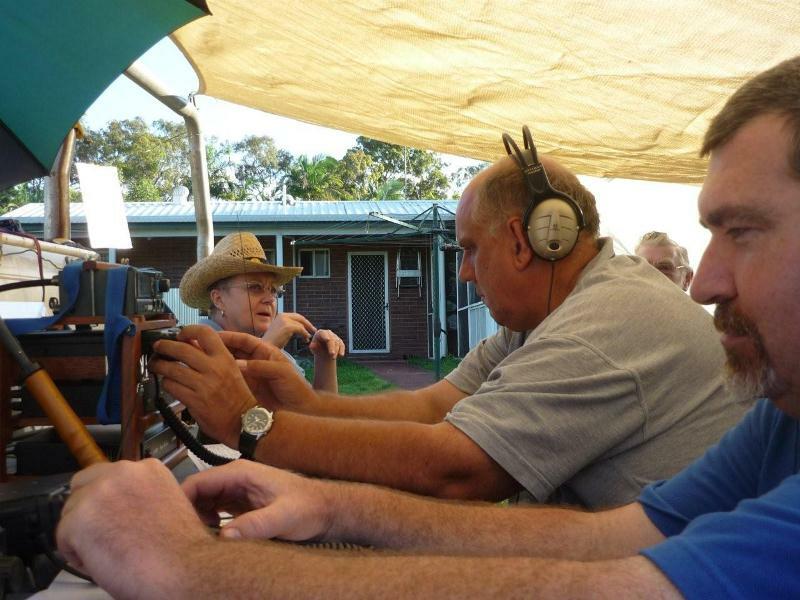 The full story and photos of the field day is at 2010 WIA National Field Day and details of VK4ION's E.N.V.I.S. Dipole is at VK4ION Antenna pages.